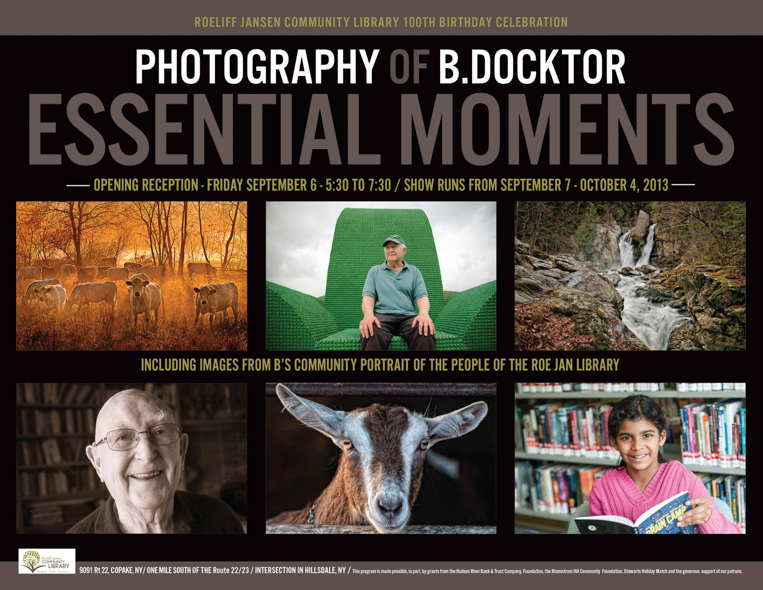 The photography of B. Docktor will be featured at the Roe Jan Library September 4-October 6, 2013. The opening reception is September 6 from 5:30-7:30 and the library is at 9091 Rt. 22 in Hillsdale NY, about a mile south of the Rt. 22/23 intersection. Versatile Ancram photographer, B. Docktor photographs everything from families to animals, landscapes and nature, to weddings, performances and events. Whether the subject is people or nature, her work always brings the comment: “Wow, that’s stunningly gorgeous!” She has a knack for capturing the most essential moments that convey the spirit and beauty of what she sees. “For the library exhibit, I am putting up photographs that feature the beauty of our area, as well as selections from the RJCL Community Portrait. I love where I live, and I so enjoy making images that show off our landscape, nature and animals. We’ll also have a slideshow of the RJCL Community Portrait playing during the opening reception which I hope will foster conversation and connection between people who may recognize each other, but don’t really know each other,” said Docktor. The show is called “Essential Moments,” and runs from the opening reception 5-7pm on September 6 to October 4. Congratulations! I know it will be awesome.